Bloody hell, have you seen how Coles and Woolworths are out to woo shoppers into shopping with them. However, they are doing nothing of interest. I’m sure they have stats to show how their ads are boosting sales. Of course their agencies will find those and/or other stats. And I’m sure the research shows that this is the best advertising since etc etc. It’s very funny. And very true. All beauty product ads do harp on about the same things. Creating stereotypes. But all categories of advertising are guilty of some degree of homogenisation aka stealing ideas. 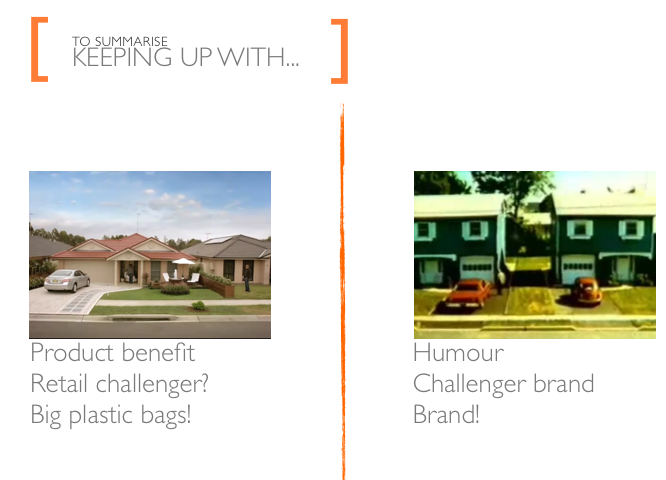 Including today’s topic, supermarket brands. Coles and Woolworths here in Australia are guilty of creating stereotypical ads: Find a celebrity (chef) and get them to endorse the brand and give a little inspiration to cheesy TV families. 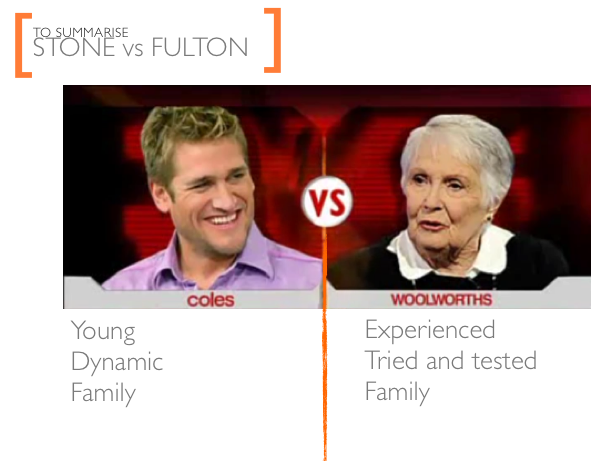 Coles have Curtis Stone. Woolies have Margaret Fulton, amongst others. Well, Luke Dunkerley, head of marketing at Woolies, has some impressive achievements under his belt. For a start he’s attributed with rebranding of Woolies with Hulsbosch’s new logo. Nice. But this TV advertising is dreadful. When I arrived in Australia five years ago, Woolworths was the brand leader. Coles was big but it was grubby. And since Wesfarmers have taken hold of Coles, Woolies seems to be the brand follower. 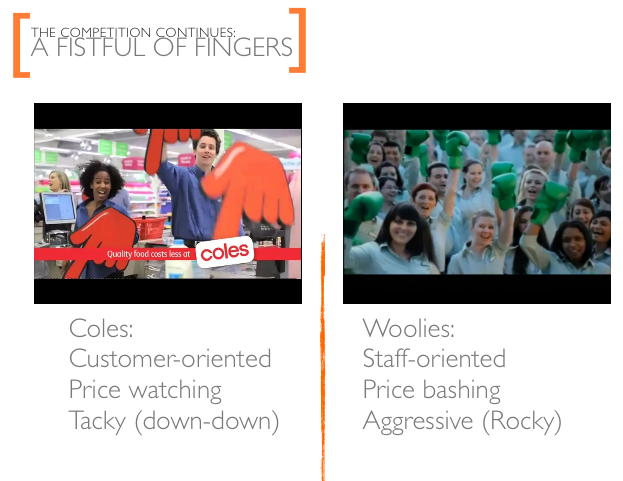 They seem to be reacting to Coles’ ads, not differentiating. Even in the price-bashing retail ads, Woolies is directly crediting their main competitor with a good idea. Emulation is flattery after all. Why is Woolworths, in both its “brand ads” (chefs build brands) and its “retail ads” (hands point down or punch up) on the back foot? IE why are these ads all so samey? Is “Celebrity” hard to do with originality? No! Of course it’s not. Have you seen the Woolworths South Africa ads? I think they’re the work of Frost Design (Vince Frost’s leading creative shop in based Sydney, who also has offices in Woolworths South Africa.) It’s great to bring in a new – important – aspect. Locality & provenance of the product that the supermarket sells. Where does the food come from: food with airmiles, as they say, is food in need of buying carbon credits. And while talking of provenance, did you see the beautiful story of where food comes from created for a Canadian audience. If you have two minutes and forty six seconds watch this and guess which brand is behind this piece of communication. And now back to Australia. Here, ALDI has been challenging the duopoly that Coles and Woolworths enjoy. And they have recently come out with an ad called SMARTER SHOPPING. It’s a basic comparison ad. Look what our shoppers enjoy over those who shop elsewhere. One is a retail challenger. The other is a challenger brand. The difference needn’t be so stark. One has an idea. One has an idea plus a story well told. So the conclusion to my presentation (to a captive audience) is simply to build upon the wisdom of a much wiser adman than myself. It’s my contention that few ideas are new ideas. Kevin Roberts (of Saatchi’s fame) famously says agencies should no longer consider themselves as ad agencies, they should be ideas agencies. Well, Kevin Roberts is wrong. It may sound like semantics, but it’s not when I say that advertising should be more than just ideas, because the ideas themselves are clearly in desperate need of great storytellers to bring them to life. And to bring them to life in a way consumers and shoppers are likely to remember to act upon those brand stories when in a purchasing mood. The stories we’ve touched on here (Celebrity, Price-Bashing, Provenance, Competitor Comparison) are just frameworks to build upon the simple story of value and convenience. After all, value and convenience are the cornerstones upon which any retailer’s brand stories should be built. And what’s more, according to a recent post, retailers should be telling stories about the new convenience and new way they can provide value, as we now shop remotely on our way to work from the comfort of public transport. So, I wonder, will my audience be captive, captivated or at least receptive to this presentation? Time will tell, I guess. Unless you tell me first, that is. Hmm – a whole piece about supermarkets without mentioning my pet project: data in retail.